Think of it. 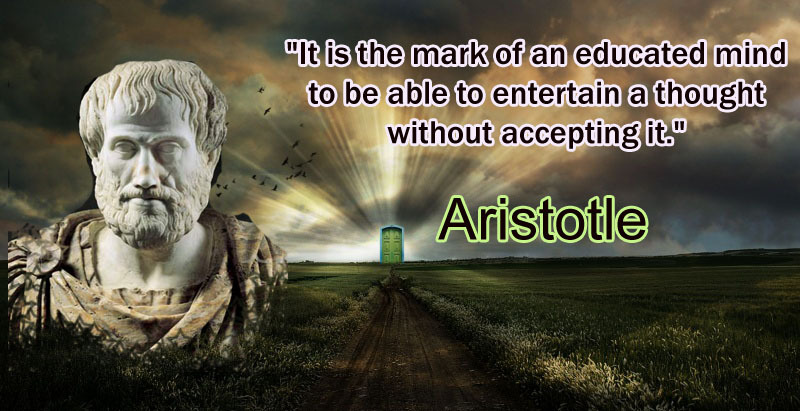 What is the meaning of entertain a thought without accepting it? It's about the attitude, isn't it? The way he sees the things around him , the way how he behaves etc. The second point is about judgment or evaluation . In the case of an average minded person, he can only entertain things which he can accept. Life is serious of pleasant and unpleasant incidents for everyone. For a normal person, pleasant things make him happy and unpleasant things make him frustrated. The educated person is creative by nature . He knows that everything happens for a reason. He is adapted to tackle adversities in life, he learns from everything, he doesn't care what others think of him, he is able to understand other people's feelings and emotions. Most important thing is his level of understating about the world and nature. We all know that the surroundings in which a person grows influences his character. Think of a poor child who usually steal vegetables from the grocery shop for his meal. He is the victim of poverty. It's the situation that compels him. So how can we blame somebody around you who is stupid by his nature? That's how they were born and it's not their mistake. Nobody is perfect and everyone has their own limits. Though an educated man thinks in a real positive way neither he wastes time for blaming others. His mind is steady whether the life is pleasant or unpleasant for him. He only lives in peace. 1) There's a story behind every person. There's a reason why they're the way they are. They aren't just like that because they want to. Something in the past created them, and sometimes it's impossible to fix them. 2) The greatness of a man is not in how much wealth he acquires, but in his integrity and his ability to affect those around him positively.